Bill Wendel of Real Estate Cafe is one of the first people I met after becoming a fellow at the Berkman Center three years ago. What he’s been doing for a long time is right up the VRM alley: equipping users (whether buyers or sellers) with the means to become independent of controlling institutions and ways of doing business — and improving the marketplace while saving themselves money and hassle. Bill will be at VRooM Boston 2009 and has told me he would like to bring up real estate as a session topic. I encouraged Bill to do that, and I encourage others to jump in and talk about it (and move some balls down the field too). Looking forward to it. Who likes being tracked like an animal by big business, big government, and every tech hustler looking to make a buck from both? Not the developers of self-tracking and personal informatics. These hot new new categories are both driven by a growing sense that primary responsibility for gathering personal data and putting it to use belongs to individuals — not to companies, governments or anybody else. These tools help individuals become both the point of integration for their own data, and the primary authority for what gets done with that data. 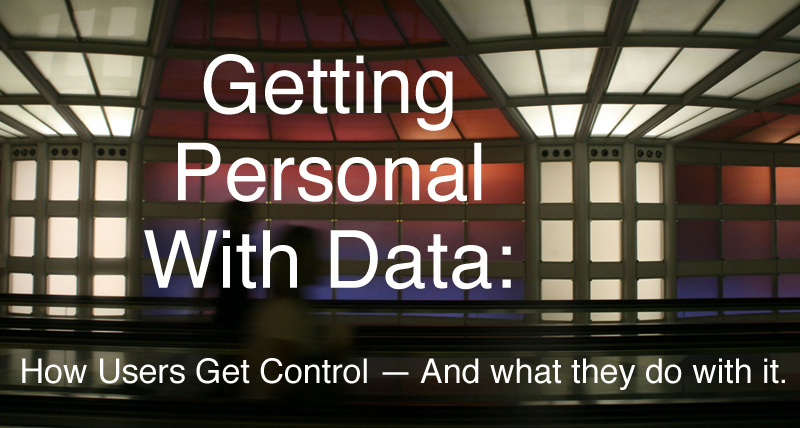 Self-tracking is how individuals collect data about themselves, while personal informatics is how individuals organize that data, determine purposes for it, and share it selectively. Together these tools inform individuals’ relationships with themselves, with their social networks, with the organizations to which they belong — and with sellers of all kinds. Tools for self-tracking and personal informatics are new, already becoming popular, and in need of much thinking about how personal data is gathered, stored and shared. Each panelist is either developing tools in these categories or has experience with new tools and the issues involved. Doc Searls, of the Berkman Center and ProjectVRM, will moderate the panel, and we expect discussion with participants (there will be no “audience” here) to be lively and informative. The panel kicks off Day Two of VRooM Boston 2009. It’s a free event, and everybody attending the panel is invited to stay, keep the discussions going, and help developers already working on these new tools. It would be nice if you registered here, so we get an idea of how many people will attend; but it’s ot necessary. Tim Hwang – Web Ecology Project. In addition Tim Founded ROFLCon, The Awesome Foundation, and Information Superhighway. He is working on a book on the mechanics of web culture and memes online. Keith Hopper – ListenLog. Keith works on digital product strategy for NPR. He is the creator of NPRbackstory, was a contributing author for the book Collective Intelligence, and has done some other fun stuff. Ben Rubin – Zeo.Ben is the co-founder and CTO of Zeo Inc. Zeo has created and recently launched the world’s first personal sleep coach. Doc Searls (moderator) – Berkman Center and ProjectVRM. Doc is also co-author of The Cluetrain Manifesto, Senior Editor of Linux Journal and working on a book titled The Intention Economy: What Happens When Customers Get Real Power.